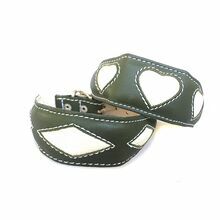 Our range of padded house hound collars is made from the softest leather for your dogs' ultimate comfort. These ultra-light and stylish hound collars look smart and are designed to be worn around the house and garden for convenience and security. House collars can be used to attach ID tags and dog leads if you need to hold your dog. Available in Metallic Blue and British Racing Green.